Although I have spent a lot of time with the horror genre, both in film and novel form, I’ve spent almost no time with novels that fall into the psychological thriller genre. In fact, The Retreat is the only novel I can think of that I’ve completed that would fall into this specific category. This was actually on sale at Audible last year, so I took the chance on the cheap price because of the strong reviews and intriguing premise. Fortunately, Mark Edwards’ novel is a great standard bearer for my time with this genre, and has gotten me excited to try more from both the him, and the genre. The Retreat tells the story of Lucas, a horror writer who finally hit it big with his last novel, Sweet Meat. He decides to head back to his hometown to spend time at a writer’s retreat while trying to write his new novel. The retreat is run by the recently widowed Julia. Not only has Julia lost her husband in a drowning accident, but she also lost her daughter, Lily, the same day. The superstitious townfolk believe that the fabled Red Widow took her, while the police believe that she drowned in the same river that her father did. Julia, though, still holds out hope for her return. Lucas finds himself taken by Julia’s story, and decides to make it his business to discover what happened to Lily. After he hires a private investigator, though, things start to take a strange turn as people around them start showing up dead. Is the Red Widow back for revenge, or is there a darker answer to all of it? What I loved about The Retreat is that I genuinely did not know if this was going to bring in supernatural elements or not. I won’t spoil it because I think that is part of the fun, but I loved the way the entire story slowly unravelled, revealing the truth. At its heart, The Retreat is very much a mystery novel. What happened to Lily? Who or what is responisible? And, most importantly, why? All of these answers are slowly revealed, and keep the pace moving briskly forward the entire novel. On top of the mystery, though, are the characters, which are richly detailed by Edwards. I genuinely cared about Lucas and Julia, and wanted to see how things would turn out for them both. Aside from the two main characters, there are a load of supporting characters that really make this small town, and this writer’s resort, feel alive. The other writers were a lot of fun to get to know as they all had very distinct personalities that were engaging in one way or another. We also get some depth to the town itself, learning of its strange, superstitious history as the novel goes on, and it was always interesting. If there is anything negative to say about The Retreat, it is that Lucas is too lucky, or too smart, at times to be as realistic as he could be. He predicts events before they happen, and even figures out the entire ending of the story before it is explained to the reader. His discoveries come way too easy for him, and it started to bother me as the novel went on, with the idea that he had the ending figured out being the annoying cherry on top. In reality, this is a small nitpick that really doesn’t have much bearing on the plot itself, but it is still something worth noting. The audiobook narrator, Simon Mattacks, does an excellent job with this one. His accent works perfectly for the location of the novel, and is never difficult to understand. The different voices he finds for each character are unique and distinct, and the way he handles the female characters works really well, which can sometimes be a problem in audiobooks. I really loved Mattacks narration work here. Some might find The Retreat more predictable than I did due to their time spent with the genre, but for me, I was surprised, and excited by the reveal of the mystery. As I was listening to this audiobook, I was posting that, even though I was enjoying the book, it felt like one that could potentially be ruined by the ending. Fortunately, that was not the case at all, and the journey to the reveal was just as enjoyable as the reveal itself. I also loved how dark the story got near the end. It went places I wasn’t expecting, and always kept me guessing. I loved Edwards’ writing style, and Mattacks delivery was spot-on. 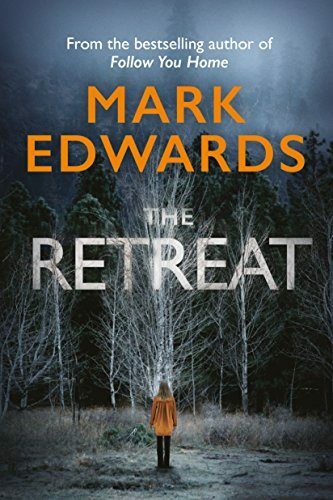 The Retreat is an easy one to recommend for fans of psychological thrillers or mysteries, and I’m glad I took the chance on it!